Now the serpent was more crafty than any other wild animal that the LORD God had made. He said to the woman, "Did God say, 'You shall not eat from any tree in the garden'?" 2 The woman said to the serpent, "We may eat of the fruit of the trees in the garden; 3 but God said, 'You shall not eat of the fruit of the tree that is in the middle of the garden, nor shall you touch it, or you shall die.'" 4 But the serpent said to the woman, "You will not die; 5 for God knows that when you eat of it your eyes will be opened, and you will be like God, knowing good and evil." 6 So when the woman saw that the tree was good for food, and that it was a delight to the eyes, and that the tree was to be desired to make one wise, she took of its fruit and ate; and she also gave some to her husband, who was with her, and he ate. 7 Then the eyes of both were opened, and they knew that they were naked; and they sewed fig leaves together and made loincloths for themselves. 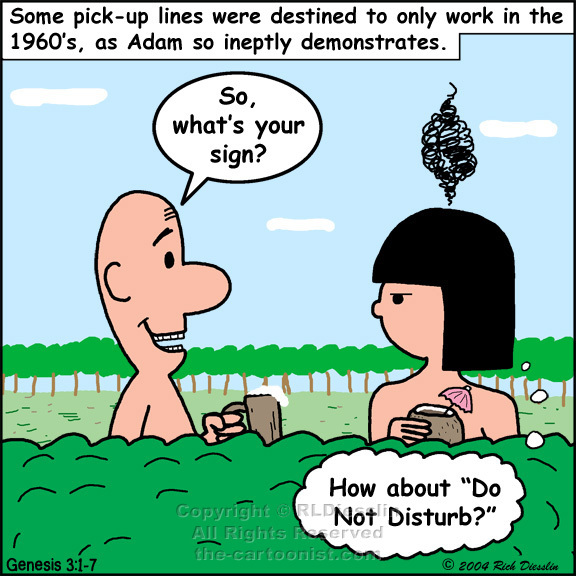 I'll get to the serpent in the next cartoon, but here I simply strayed from the story to imagine Adam and Eve's courtship just a bit. It shows just how lame the classic bar pick-up line really is. It didn't even impress Eve, even though Adam was the only guy on earth. Back to the story, we see the crafty serpent working on Eve to eat the fruit. Even though a lot has been laid on Eve here, note that Adam just happened to be with her presumably for the whole time without saying anything. So they both get to share in the blame. Interestingly the things the serpent tells them are true and false at the same time. The fruit is good for eating, but it sort of kills them in the long run. It was good for knowledge, but it didn't make them like God. If anything they now lose their innocence and can make bad choices (as well as good) and become responsible for them. As animals, they were ignorant and amoral, now they are self-aware and can choose between bad and good and thus moral with the capacity to be immoral. While they had free will before the apple, now (because of their knowledge) they really are responsible for their decisions.